SOW: How old were you when you first took an interest in food? What is the first dish you can remember helping to make at home? I became interested in cooking at a very young age. As long as I can remember, I have always been helping out in the kitchen. But the first dish that I really cooked from scratch was Panang Curry; I even picked all of the herbs & spices that went into the curry paste from our garden. SOW: From your grocery store which you opened as a mere teenager, to your multiple Thai restaurants and food stalls, you seem to really have a keen understanding for how to combine business with food. What is your biggest secret for success? Being true to myself and honour my family recipes. All of my businesses have always been about authenticity and never forget where I came from. SOW: Your recent book, Rosa's Thai Cafe: The Cookbook has also been a huge success. How was the process of writing the book for you? What do you want readers to know about your book? **- Every recipe in the book have always been in my head, I've never written them down anywhere. It just came pouring out of me when we started writing it! The book is like my treasure chest with all kinds of family recipes, secrets, tips & tricks. It's definitely a labour of love that I want to share with everyone. Thai basil, lemongrass, keffir lime leaves...I can keep going! I have a seperate fridge for Asian herbs. SOW: What is one myth or misconception you would like to debunk about Thai cooking or Thai cuisine? Thai food is easier to cook than it looks. Most people think it takes too long to cook, but it's all about the prep. If you make curry paste or sauces, they will last for a while in the fridge. All you need to do is add coconut milk, meat and veg and you're done! SOW: What is your favourite kitchen gadget or tool? Food processor! I love my pestle and mortar, but mini food processor helps speed up the process when making pastes and dipping sauces. SOW: You and your restaurants seem to have a very loyal customer base. What has been your biggest asset in developing that relationship? We don't compromise on the flavour of our food. Fast and friendly service also go hand-in-hand with casual Thai dining, similar to what you would experience in Thailand. Our customers love this and they always come back! SOW: What will students learn by coming to your upcoming class with School of Wok? What do you want to share with them? 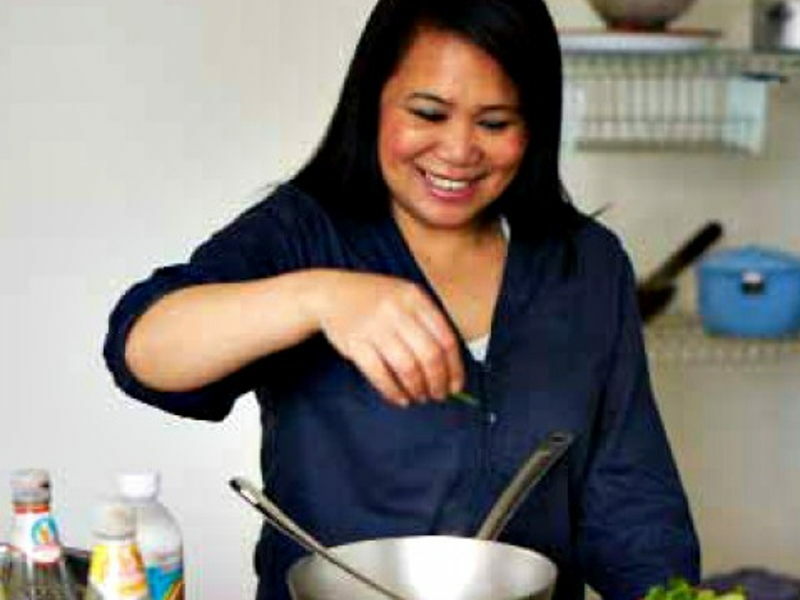 I have lots of tricks and short-cuts to help you cook an authentic Thai meal at home. We'll learn how to balance the sweet, salty, sour, and spicy flavours in any dishes. And most importantly, I want to show you that cooking Thai food is fun and easier than you might think! SOW: What is your favourite meal (Thai or not) to eat? When I'm not eating Thai food, which is most days of the week, I love to have Italian food. My favourite is Il Bordello restaurant in Wapping.